To paraphrase Faulkner, the past is never over in Bunnell. It’s not even past. So it is with Bunnell City Manager Armando Martinez. Martinez was fired by a 3-2 vote less than six weeks ago. But there he’s been since, attending city commission meetings, running the city, participating at forums and celebrations and commending staffers, including his finance director, who quit by blaming the commissioners who fired him. Martinez hadn’t left yet because the commission’s firing was velvet-gloved: even the three commissioners wanting to get rid of Martinez were willing to let him serve out his contract until October, ostensibly giving them time to find a replacement. On Monday night, again late into the night—this time at 9:15 p.m. instead of the midnight vote that was to end Martinez’s tenure—the city commission reversed itself. Or rather, Bill Baxley, the swing voter in every case, reversed himself. On a 3-2 vote, the commission agreed to negotiate a new contract with Martinez. Baxley joined Mayor Catherine Robinson and Commissioner Jenny Crain-Brady in the majority, with Elbert Tucker and John Rogers in dissent. “I have not changed my mind,” Baxley protested. “When we brought it up to vote to fire him I voted no. But my campaign that I campaigned on, to the citizens of Bunnell, the people that elected me, my comment to them, or my pledge to them, that I would not renew his contract as written, and that’s exactly what my campaign—I’m still in that same vote.” He said the board had voted not to renew the contract despite the suggestion to renegotiate: that motion was rejected. Baxley had asked for an agenda item: to discuss the possibility of appointing an interim manager—and to have Martinez train that interim, even as Martinez was on the job. Baxley this evening revealed that he’d spoken to some department heads who would be willing to serve in that position, and who told him that their subordinates could step in their shoes. That raised some eyebrows on the commission: both Robinson and Crain-Brady, for just reason, questioned another commissioner’s authority to explore administrative issues without the commission’s consent. Robinson also wondered aloud why Baxley was willing to have the man he was getting rid of train his replacement. If that were the case, Martinez’s quality as a trainer could be skipped, and his quality as a manager retained. “Basically you’re revalidating what he was doing,” Mike Langello, a Bunnell business owner and city booster who attends most commission meetings, told Baxley. Langello was among few members of the public (fewer than in previous similar episodes when Martinez’s fate was the issue) who pleaded with commissioners to end the yo-yo effect of debating Martinez’s viability. And after another impassioned defense of Martinez, Robinson, who knows how to outflank her opponents, surprised Baxley by upstaging his proposal, turning the tables on him–and his own arguments against him–and moving to have a new contract negotiated with Martinez. Rogers tried to have the issue tabled. He wanted to think matters over. His proposal got no second. And Robinson flatly stated that she had no interest in withdrawing her motion: she had sensed an open door. 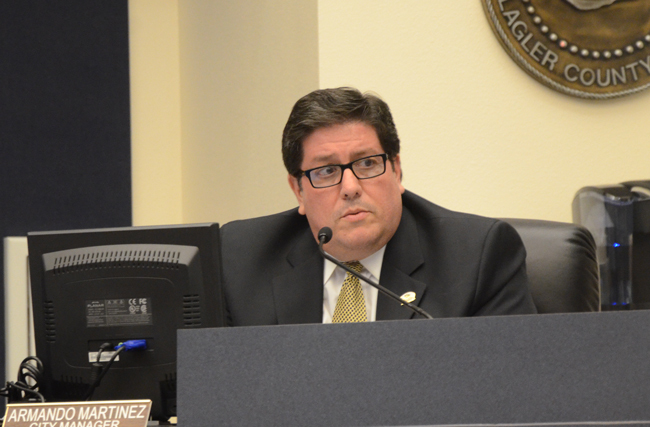 When Roger called for a vote (he’d taken over the gavel as vice mayor, since Robinson could not make the motion while chairing that portion of the meeting), Martinez again had his 3-2 majority. It was yet another remarkable turn of events in Bunnell. But it is not necessarily over. The scene next moves to a negotiation with Martinez (that responsibility falls on the attorney and the commission), with salary terms yet unclear. Martinez may have to concede that his current salary of around $112,000 will not sit well with Baxley. And he told Rogers that he was willing to relocate to Bunnell, or at least Flagler County. Still, all these terms are as uncertain as Martinez’s fate has been for the past several months. Please bring in the elephants and clown cars. Every article I read about this disfunctional city makes me scratch my head. I sure feel bad for the citizens of Bunnell. I wonder why they’re not packing those meetings and voicing their opinion. How does this city not implode? Bunnell’s drama is starting to rival Flagler Beach’s. Ah, Bunnell…Where IQ’s go to die. How is this place still a City? Why would anybody want to work there? All that’s missing are the lions and elephants, the clowns are already there! They should consolidate Flagler Beach and Bunnell, Then sublease the Taj Mahal from the county, and rent it out to the City of Palm Coast. Make Armando King of it all! I wish you people would get you stuff together it is very embrassing ? Nay, yay,nay,yay or put another way no, yes, no, yes. Better a good performing manager “already known” (considering that nothing and no one is perfect), than an all stars and excellent new one not proven yet, on the market! C’mon Mr. Martinez move to Flagler County with this new given chance and give the good example of investing what we pay you here. You will save a bundle in commuting and also will save energy to improve your work. Now who doesn’t make a tv show of this bunnell commission is a total fool it’s ratings would go through the roof it would fit right in on daytime drama prime time looks like the blades need sharp ing on the good ole boys political lawnmower it lost its oomph!!!! Time for a new set of blades guys!! !, this comes as a total 180 flip I wonder who or what changed mr baxleys change of heart so fast no less I guess it will play out at the next meeting. I need to start attending these shows,,, I mean meetings sorry for that typo. According to the bunnell majority mr Martinez is more than welcome here except of course of the small Neanderthal’s still poking there noses in the bunnell govt. As a business owner I have seen my business go up 17% since the city of Bunnell and the Mayors new staff have been more involved in brining more activities to our city.I just can’t believe that the citizens of Bunnell have not seen how Mayor Catherine Robinson,Manager Armando Martinez.and the staff of Bunnell work so hard to make this a better city.Thank you to commission Bill Baxley for seeing how much these people mean to our community. Baxley reminds me of driving your car up north in the winter. When you hit a ice patch in the road , you don”t know which way your car is gonna go either. Being a resident of Flagler County, maybe even Bunnell, should have been in his contract in the first place. How can someone working for a city or a county in such a capacity care about what he does if he’s not invested in the outcome? The mayor and the commissioners live here and I know most of them have grown up here and maybe even like me, was born here….they have an added investment in making sure the city is ran properly and right for it’s citizens….why they have allowed this to continue is beyond me. They already have this show on television – It’s coming in October named……. Home Town Security vs Honey Boo Boo! Mr. Martinez is a class-act. His peers fear him because of this fact. Have you noticed that the man even LOOKS and BEHAVES like an elected official should? No Hawaiian shirts, shorts or flip-flops for this fellow. The City Manager needs to work with all the Commissioner, not just three of them. Martinez thinks he just needs to keep three of them happy. Martinez needs to go bye bye. He sure is sir just ask any ethical lawman around here. He’s been known to have maybe violated some poor folk civil rights a time or two. Or ask any minority that has been harassed under his control.